Arguably the top racing game available on the App Store, Raging Thunder, is now on sale for $3.99. That's 50% off folks... not a deal to pass up if you enjoy your racers! Ok, next up we have some good news for those of you who still have not bought a great little game called Spore! Spore has just dropped a few bucks to $7.99. Two bucks off is better than nothing right? Definitely check this one out people. You won't regret it, and if you still need some more information on it be sure to check out Dieter's full Spore for the iPhone review. I'm one of the biggest South Park fans you will find, so anything related to South Park I love. Well South Park's ImaginationLand is now on sale for $2.99! For all you fans out there, do not let this one pass you by! Also be sure to check out what else is coming to the App Store soon from South Park. 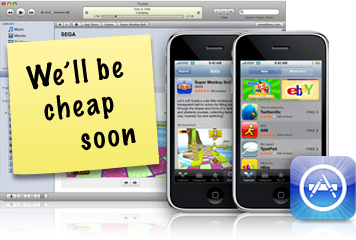 Seems to have been a slow week for price drops but the ones that did drop are quality apps. Be sure to pick them up for those sale prices! If we missed anything worth mentioning, please let us know in the comments!